I was dispatched immediately to a young pedestrian struck by a vehicle with injuries. It was right outside an elementary school and Fire and EHS were also Code 3 (Lights and Sirens). As a parent I was hoping the whole way there that the injuries weren’t serious. As I got on scene there were people everywhere and my job was to ensure that Fire and EHS crews could assess and treat the young student while trying to determine what happened. Fortunately injuries were fairly minor, with some bruises and a broken leg. I spoke with the driver and witnesses. The driver was extremely upset and obviously never intended or expected to hurt anyone on his way to work. Through the investigation it was apparent that it was an accident and the young student was crossing the road away from a cross walk and through a lane of stopped traffic, the oncoming driver didn’t see the student until they were right in front of the bumper. The young student’s family was already on scene. Once I cleared from that scene I was dispatched to a possible assault and breach of conditions. I spent the afternoon taking statements and investigating a possible criminal matter however it turned out to be false allegations and an attempt to win a child custody and child support case. I very carefully explained the concept of the criminal charge of public mischief for making a false complaint to police. The sound of a tone alert over our police radios is a sound that gets every police officer’s blood flowing. The warble tone is a distinct alert that is broadcast when there is a high risk call or a call in progress. 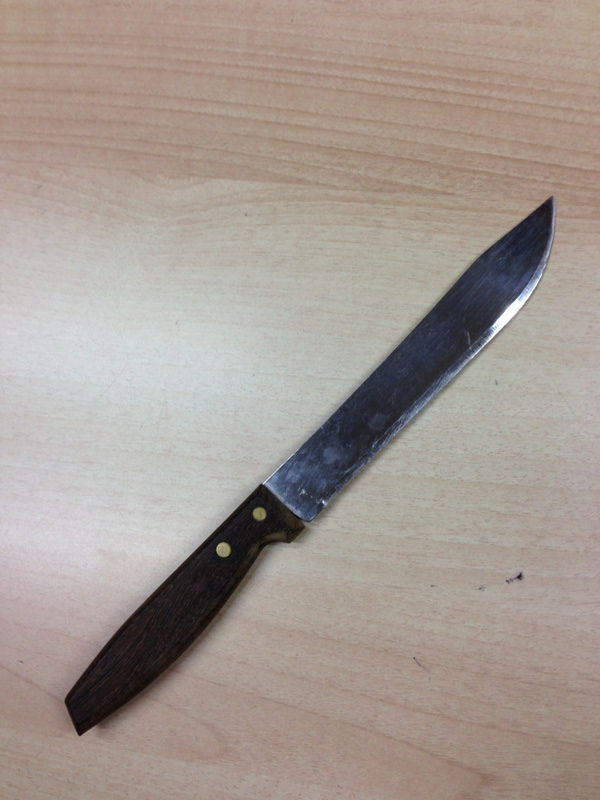 This night shift we had a report of a robbery in a liquor store and the suspect was threatening staff and pedestrians with a large knife. The boot and her field trainer got into the area at the same time I did. They found the suspect in a gas station as I checked the bus stop. 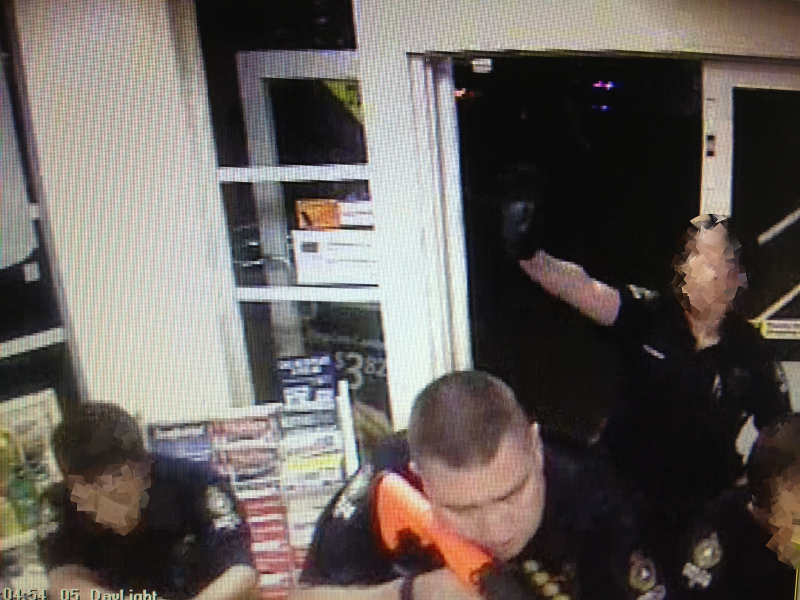 The suspect still had the knife and was in the store area of the gas station. The suspect was not listening to police. I deployed a less lethal bean bag shotgun to create layered force options and provide a less lethal option for dealing with an armed suspect at a distance. Our actions were caught on the store’s CCTV camera and you can see how we layer force options. I took over verbal commands and began directing the suspect while my platoon mates kept me safe with lethal overwatch and others coordinated getting staff out safely. These scenarios unfold extremely quick and we plan on the fly. I can’t say enough good things about our training staff and management support for the training, practice and tools that we have access to on patrol in order to keep the public, the suspects and ourselves safe. After what seemed like several minutes of a tense stand off the suspect complied, put the knife down and was taken into custody without anyone being injured. As a team the investigation was completed and another suspect safely in custody. The night began with a debrief of the events the previous night and as always a frank discussion about what we learned and what was done well. I was dispatched from the debrief to a 4 car collision that was caused by an impaired driver. Another member assisted with the collision while I dealt with the impaired driving investigation. Consider for a moment the amount of impaired drivers that you read about me dealing with and the potential that they may cause harm to someone. Then consider I’m just 1 member on a platoon, with 4 platoons in Delta alone. I still get people asking why I pull over cars “instead of arresting murderers”. I like to think I prevent potential homicide by stopping impaired drivers. After I cleared the initial impaired driving investigation I was dispatched to cover a member with a domestic assault. I took custody of the accused, he’d been drinking and while walking him outside he decided to take a run at me. He ended up in handcuffs on his way to cells very shortly after. I covered another platoon on days off and worked a call out night shift for them. It was a fairly routine night. On a callout shift I know the platoon I’m working with is short resources so I avoid doing any of my paper work and just stay on the road taking calls or covering other officers. At one point in the early morning I saw a car take off at high speeds from a stop light about a block in front of me. I was fairly certain from the distance away I was and the dark of night the driver had no idea the headlights behind him in the distance was a police SUV. I followed him for several blocks observing some dangerous driving and not wanting to make it worse by starting a pursuit. Once I could get close enough to get a license plate the car veered into a residential neighbourhood and I backed off, only to come across a collision around the corner. The driver had lost control and hit a parked car. I ended up arresting the driver for criminal code dangerous driving, driving while prohibited and impaired driving. The driver had already lost his drivers license from previous impaired driving charges an was prohibited from driving. I spent the rest of the night with the investigation and reports. In speaking with the driver, he had no idea he was even being followed, much less by Police. Alcohol and driving don’t mix at the best of times, when the driver has a complete disregard for the rules and public safety it’s a recipe for disaster. I had no regrets hearing the ratchet of the handcuffs as I put them on his wrists.